Employee disengagement is a looming issue in today’s global workforce that affects everything from company productivity to customer satisfaction. In order for companies to reverse, or better yet prevent the damaging effects of disengaged employees, there must be a constant emphasis placed on improving the 10 pillars of employee engagement, which accounts for things such as the relationship between employees and managers, overall happiness and wellness, company alignment, relationship with colleagues, etc. Download the complete checklist of the 10 most important metrics you need to track in order to keep your employees engaged. <a href=”https://www.officevibe.com/blog/disengaged-employees-infographic”><img src=”https://assets.officevibe.com/infographics/infographic-disengaged-employees.png” data-no-lazy=”1″ alt=”10 Shocking Stats About Disengaged Employees” width=”600px” border=”0″ /></a>This infographic was crafted with love by Officevibe, the platform that helps you to <a href=”https://www.officevibe.com/employee-engagement-solution/leadership”>be a better leader</a> and make your employees happy. Employee disengagement refers to the way that an employee feels about and is connected to their job, which translates to the amount of effort they put into their work, and their sense of commitment to their organization. There are many causes of employee disengagement, but the first thing to understand is that disengaged employees are not necessarily equivalent to bad employees. They were likely not hired in this state, rather, disengagement is a symptom of a potential series of larger problems that led them to be this way. According to Gallup, 70 percent of employed Americans are disengaged. That’s essentially 3/4 of the American workforce. The scarier part is that not only are they disengaged, but there’s a percentage would actually go out of their way to damage the company they work for. If you don’t know how employees feel about your company, it’s really important to find out. The Employee Net Promoter Score (eNPS) will help you collect this data. Ultimately, you want to have your employees acting as promoters for your company, not detractors. This will help you both keep and attract top talent, avoiding the high cost of turnover. It’s up to the manager to find out what employees are unsatisfied with their role. 1. Workload: Do your employees have too much work to finish in an unrealistic amount of time? Are they needing to work on the weekends, stay long hours, and neglect a work-life balance? 2. Benefits: Does your company offer perks and benefits that are desirable for your employees – enough that they are excited to come to work? Think beyond health benefits. 3. Clarity of role and expectations: It’s really important that your employees know exactly what is expected of them. This might seem obvious, but often lines get blurred and it can become anxiety-inducing to not know your exact jobs or role. Make sure to provide employees with clear goals and expectations. 4. Office environment: Do you have an inviting office space where communication and creativity are encouraged? 5. Salary: Employees need to feel that they are properly compensated for their work, and if they don’t, then there is no doubt that the quality of their work will suffer. Did you know that 89% of employers think that their employees leave for more money, but only 12% of employees actually leave for more money? This is a really important lesson. People don’t just come to work for a paycheck. We spend so much time in the office that it’s important to feel excited about coming to work. Dreading your work day isn’t worth the money, which is why it’s important to make sure that the office environment is as stress-free as possible. 1.Communicate Be a manager that they respect, not fear. The simple way to do this is to constantly communicate with them. Speak to your employees about more than just deadlines and work-related issues.This means making a point to say good morning to your team, make time to laugh and socialize, and give them positive feedback throughout the day. Simply put, for a friendly office environment, be friendly. 2.Create a fun environment Make sure that the physical space is not bleak, but inviting. At GSOFT, we have fun company culture quotes up on the wall, we’re allowed to bring our pets in, we get around on skateboards and scooters and loungers and we have work huts where we can move to when inspiration strikes. Basically, there’s a personality to the office aesthetic that makes it welcoming – not just rows of desks under florescent bulbs. 75% of people that end up quitting do not quit their job they quit their boss. We have gone over how bosses can ruin employee motivation, but imagine it getting to a point where it becomes so unbearable that you’ll be willing to give up on your job completely. Being a manager is a really tough role because it’s a combination of many roles in one. You’re a boss who needs to delegate and make sure things get done, you’re a friend and confidant to your employees when they need to chat about work-life stressors, you’re a teacher in that you’re meant to inspire your employees to reach their goals, and you’re an employee as well, who needs to report to your own superior with quality work. 1.Communicate constantly Hold monthly one-on-ones to over your employee’s work and give them constructive ways in which they can improve. They want this feedback because it allows them to make progress and achieve their goals. 2.Recognize their hard work. And do this as often as possible. It takes so little time out of your day and it requires so little effort to let your employees know that you appreciate them. The return on this investment will be your employees’ confidence and gratitude, which will keep them engaged and working their hardest. When you neglect to commend your employees for a job well done it becomes uninspiring for them to continue to produce great work. 3.Bring some fun to the team. All work and no play make for a very uninspiring day. It’s important to remember that you have a team of humans, not robots, and people need a boost of energy and a dose of fun to make the menial tasks seem less daunting. Organize off-site lunches to treat your team and encourage socializing or break up the day with office icebreakers for a good laugh. 4.Encourage work-life balance. It’s really important that your employees know that you value them as complete individuals, not just workers. Expecting them to stay overtime, reaching out on the weekends or after hours, and not showing an interest in who they are outside of the office are all ways to disengage your employees. When you respect them and work-life balance they will respect you back in the form of quality work. What we’re doing here at Officevibe is creating fun and engaging workplaces by using enterprise gamification. We want to bring people together to think of work as a game that they can complete all their tasks and feel an extra bit of encouragement and employee recognition. Each week, Officevibe sends 5 questions to each employee to see how they are feeling at work. With the data that’s collected, managers are able to have a holistic view of the team, and gain insights from the employee engagement software on what needs to be fixed, and how to fix it. 90% of leaders think an engagement strategy will impact business success. However, only 25% have a platform or a strategy to influence their employees. The first step in keeping your employees engaged is keeping tabs on how they are feeling. We suggest conducting weekly, anonymous surveys that will allow employees to express themselves and their concerns. Pulse surveys, like we use at Officevibe, are quick, efficient and fun surveys that help you collect data from your team, giving you both an overarching view on how everyone is feeling, as well as specific feedback. The most important thing to remember with these pulse surveys is that you need to take action with the responses. Collecting data and feedback and not doing anything with it is a sure way to keep your employees disengaged. Only 40% of the workforce knew about their company’s goals, strategies, and tactics, and this can prove to be really detrimental to the success of the company. When an employee feels connected to a mission, they are more likely to enjoy working for it. When goals and values are both understood and aligned, and employees feel included in the progress of the company toward these goals, they are sure to be more engaged. The first step in fixing the disconnect is to be transparent with your team. Let them know your goals and be open about sharing numbers. Including your team in every detail of the company’s value and purpose will make them feel part of something bigger. Hold meetings to go over the values, repeat and reiterate the mission, ingrain it in their day to day so they have something bigger to work towards than just a deadline. 43% of engaged employees receive feedback at least once a week, compared to only 18% of employees with low engagement. If someone is struggling, waiting to talk to them about it at a “TBD later date” won’t do much in helping to inspire them or help fix the problem. Keep it constant.This includes everything from praise for good work to constructive criticism for work that can use improvement. The point is not to wait to say “great job” or, “let’s go over your last assignment and see how you can start improving today.” Waiting for monthly check ins or annual reviews is a disservice to everyone as it inhibits growth. Remind them that feedback is for them. It’s important to let employees know that any feedback sessions are for them. That they are safe places to discuss anything that they feel concerned about, or want to work on and improve. Making the feedback process positive makes receiving feedback (even negative) less daunting, because employees know that you are both working towards the same goal of helping them feel and be the best they can be. Ask for feedback on your performance.T It’s a universal truth that everyone can use improvement, so ask your employees for feedback on your performance as a manager to level the playing field and let it be known that even you have areas you can improve upon. Companies with engaged employees see 2.5X more revenue than companies with disengaged employees. This proves the financial benefit of investing in employee engagement. When employees are happy they work hard to produce quality work ensuring happy, return customers. On the other hand, disengaged employees can cause up to $550 billion annually because employees aren’t concerned with the quality of their work, or the retention of your customers. If you want to measure how much money your company can save by investing in employee engagement, try our interactive ROI calculator. You’ll be surprised. 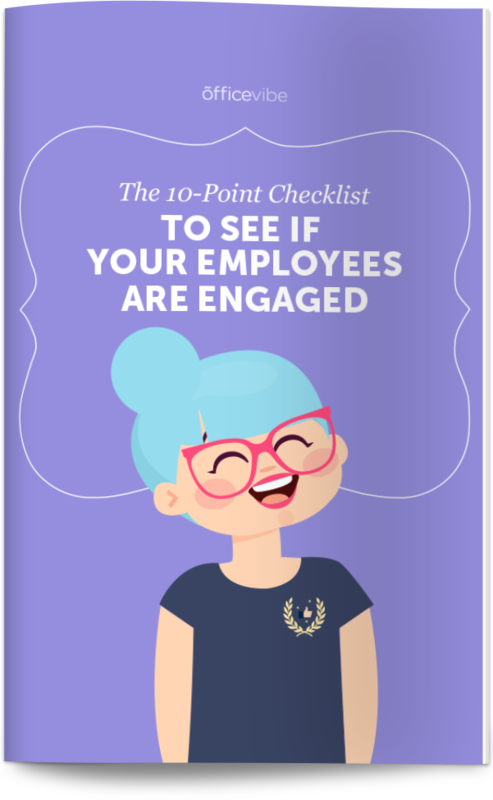 Download the complete checklist of the 10 most important metrics you need to track to keep your employees engaged. How does your company work to keep employees engaged?